My name is Preston Harden, I'm from Commerce, Georgia and a graduate from the University of Georgia. 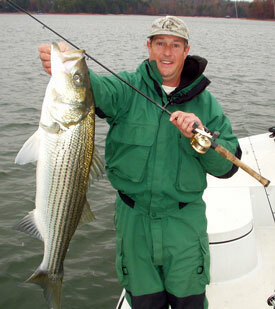 I have been guiding on Lake Hartwell since 2001, but I have been fishing for stripers since the mid 1980's. I fish year round at least five days a week. I trout fish out west and chase red fish in Louisiana, but stripers and hybrids occupy most of my time (about 200 days a year). My home is about 50 yards from Lake Hartwell and my boat stays in the water ready to go. I prefer to catch fish on artificial - either fly or spin - but if you want to use bait, it is no problem. I have been flyfishing since I was 12 years old and I fish with a fly much of the time.